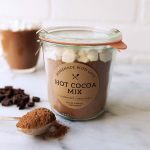 There are lots of great options for simple homemade gifts here on TY: Healthier Hot Cocoa Mix, Homemade Chocolate Bark, Paleo Chocolate Chip Cookie Mix in a Jar, DIY homemade Vanilla Extract, Essential Oil Holiday Room Sprays, Crock Pot Pumpkin Butter, Coconut Butter, Nut Butters, Candy Cane Hot Cocoa Mix, Chai Concentrate, just to name a few of my favorites. 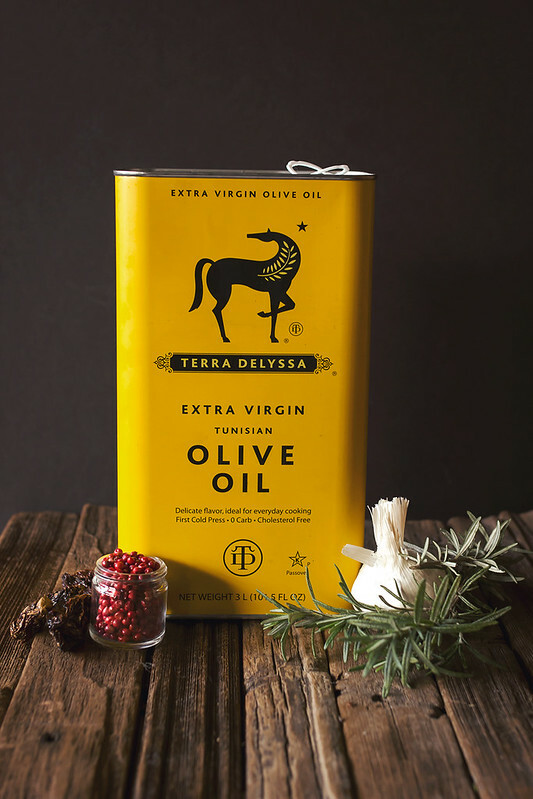 Most importantly, always choose a high quality extra virgin olive oil like Terra Delyssa and whether fresh or dried, always opt for the highest-quality, organic (when possible) ingredients for infusing. Using a mortar and pestle crush a couple of the chipotle peppers, to release their flavors. Heat the oil over a low heat until it reaches 180ºF. Remove from the heat and pour the hot oil over the chipotles. 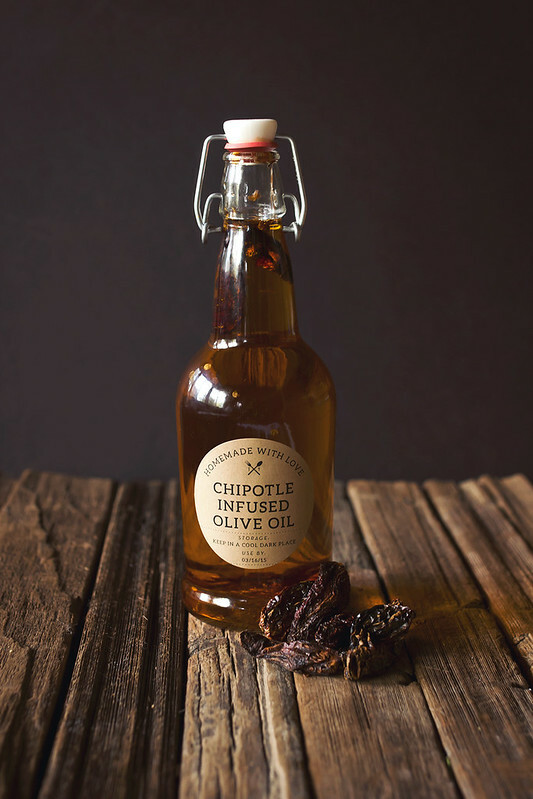 Allow to cool and pour into your air tight bottle, adding a couple of the dried chipotle peppers and some of the seeds. Tightly cap and store in a cool dark place (or the refrigerator) and use within 3 months. 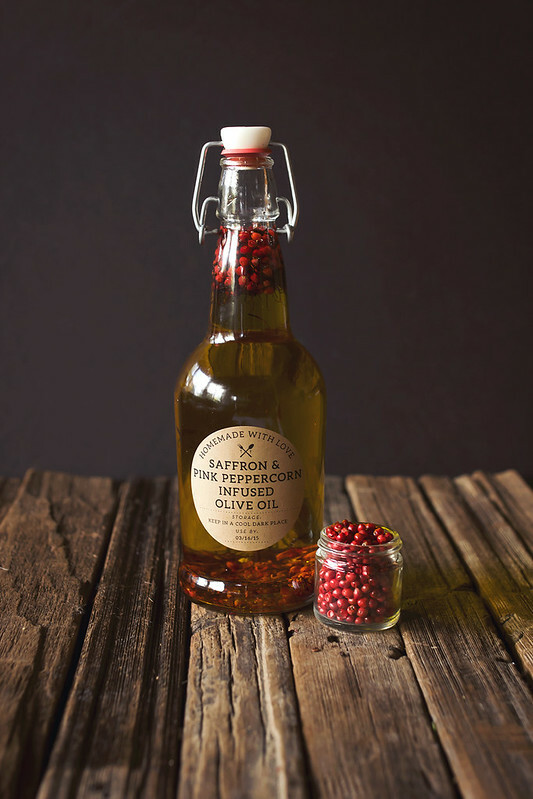 In a saucepan over a low heat, heat the olive oil to 200ºF. Add the garlic cloves and allow to cook for about 5 minutes, don’t let the garlic burn though or your oil will have a bitter taste to it. Lower the heat or turn it off, if necessary. Remove from the heat and strain out the garlic. Pour into your air tight bottle, tightly cap and allow to cool. Once cooled, store in the refrigerator and use within 1 month. 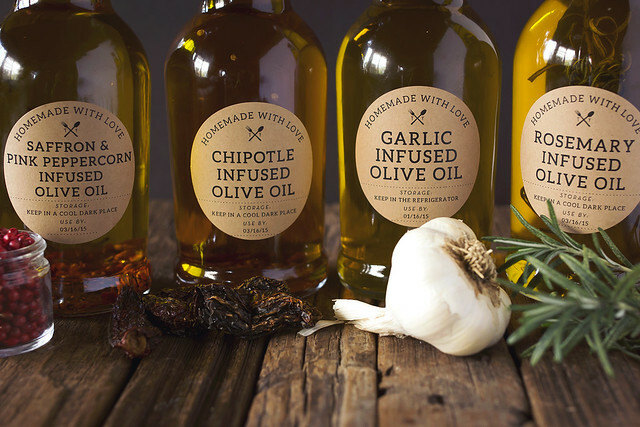 Download a customizable version of these labels to print at home to give your homemade infused olive oils an extra-special personal touch! 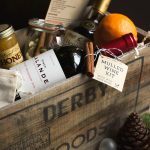 Grab your printable PDF, print out on your sheet of blank labels and simply write your name in under “by:”, fill in the flavor of your infused olive oil, the storage instructions and the date it should be enjoyed by. That’s it. DOWNLOAD HERE. Print these 2.5-inch diameter labels on any Avery brand 22808 template, 2 1/2-inch circle labels. 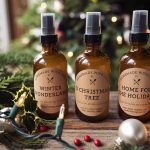 I used these brown kraft paper labels. 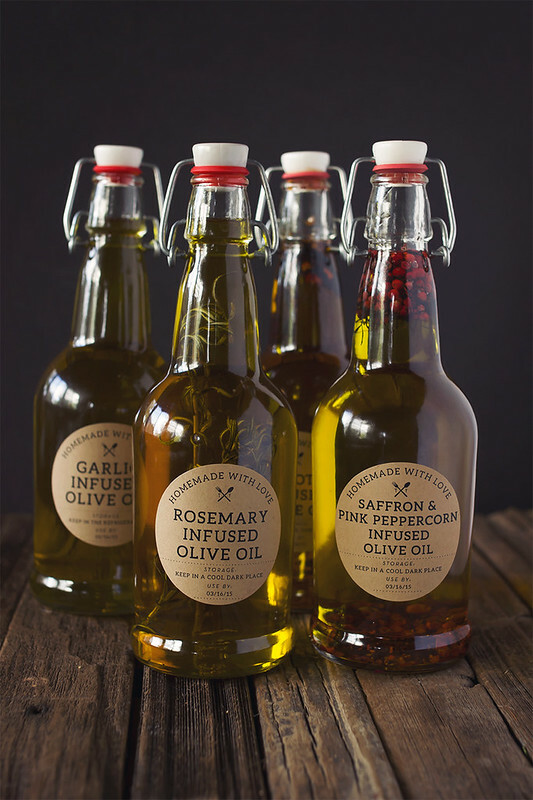 Wow, these are great, especially the garlic infused olive oil which is my absolute favorit. 🙂 Can’t wait to get home and try this out. Also, thanks for the printable labels, I’m downloading them right now. 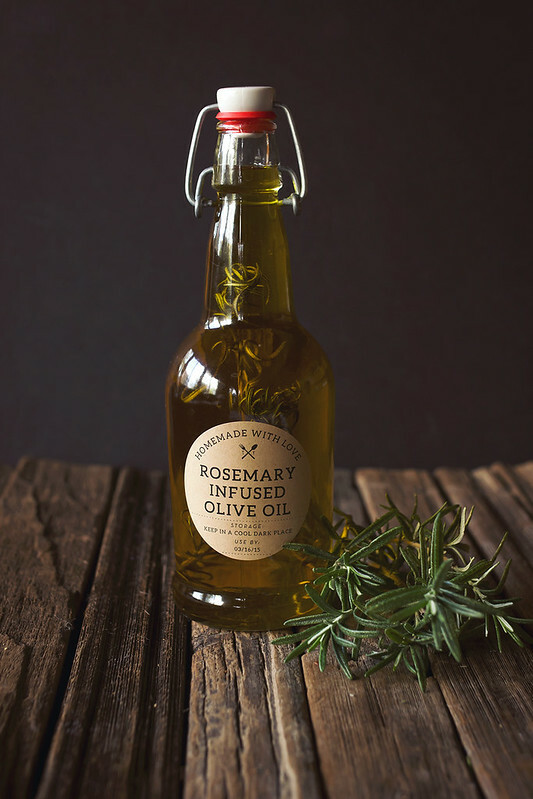 If i don;t have a dehydrator, can I put the rosemary in the oven? Yes. I dry a lot of my herbs that way if my dehydrator isn’t out at the moment. I turn the oven light on & leave it overnight with my herbs on a cookies sheet. Just the heat from the light will dry them. how do you make the advertising go away on the left and bottom so I can read the article? Want to try but between the row on the left and Avon on the bottom it gets aggravating trying to scroll in between …. Where did you get these bottles? Hey Lauren, I think I bought them from http://www.specialtybottle.com or Amazon.com, I can’t recall which. It’s been too long. Sorry about that. Very interesting but I was not able to finish reading because of your background chevron print. I started getting a headache and feeling dizy. hahaha, I am assuming you are kidding? 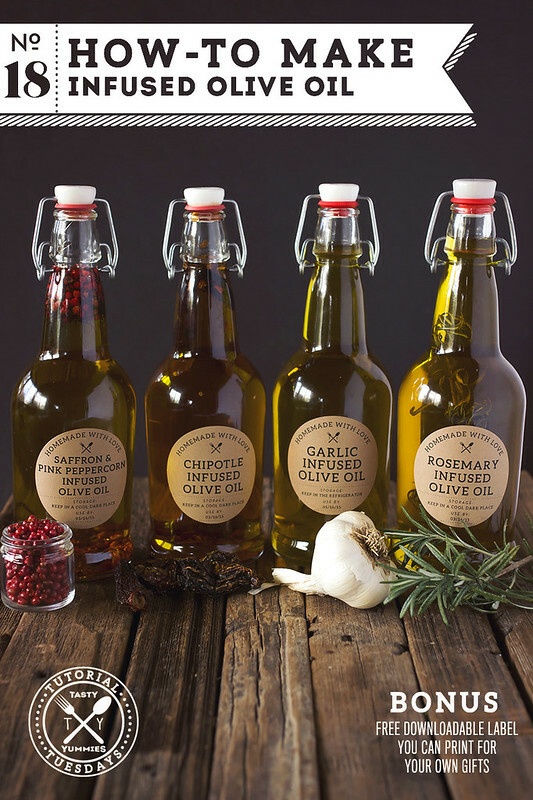 Why is a garlic infused oil OK, but not garlic itself when restricted to a low FODMAP diet? Hi! great tutorial. I tried to grab the PDF template and says page not found. 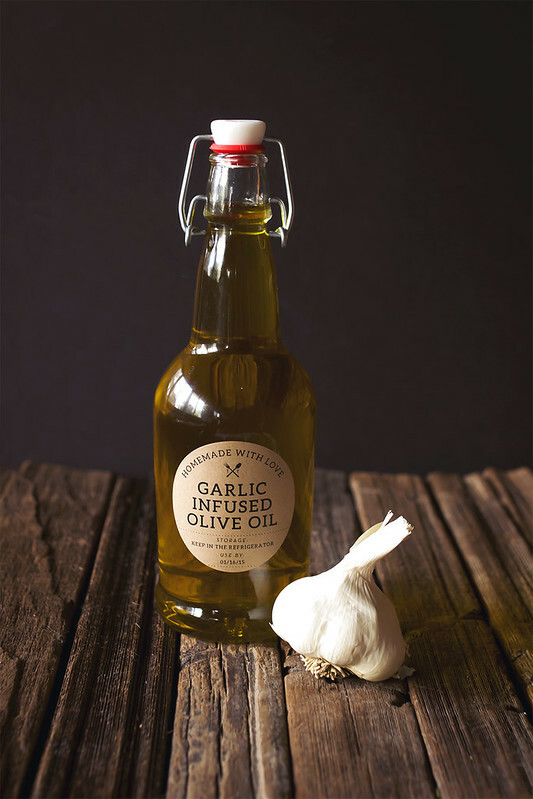 Can you used freeze dried garlic to make the garlic oil??? Tracy, I haven’t tried that myself, but I don’t see why it wouldn’t work. Just get it to the appropriate temperature and strain. Some of the tips are really great. They are. However, I will have disagree with your method of heating the oil to 180F. If you have a beautiful, hiqh quality extra virgin olive oil, you shouldn’t alter its nutritious benefits (vitamins etc) by heating it. Simply letting the garlic/herbs/spices for a day into the EVOO is enough. Then strain and you’re ready. Not trying to be negative here, really. But would never heat good extra virgin olive oil. That’s why I produce mine cold-pressed.